How much sugar in an Easter egg? Easter is just around the corner – it’s that time of the year again, when chocolate eggs and chocolate bunnies are on display in every supermarket in Ireland. This Easter, Irish children and adults will eat their way through more than 1.5 million chocolate eggs: a 168-tonne sugar rush! Have you ever wondered how much sugar is there lurking in your favourite treats? Children aged 4 to 6 years old should eat no more than 19 grams of added sugar a day, while children aged 7 to 10 years old should have no more than 24 grams. A standard-sized Cadbury Creme Egg alone contains 26.5 grams (6.5 teaspoons) of sugar. Some larger chocolate eggs can contain 8-10 times the recommended daily sugar intake for children. 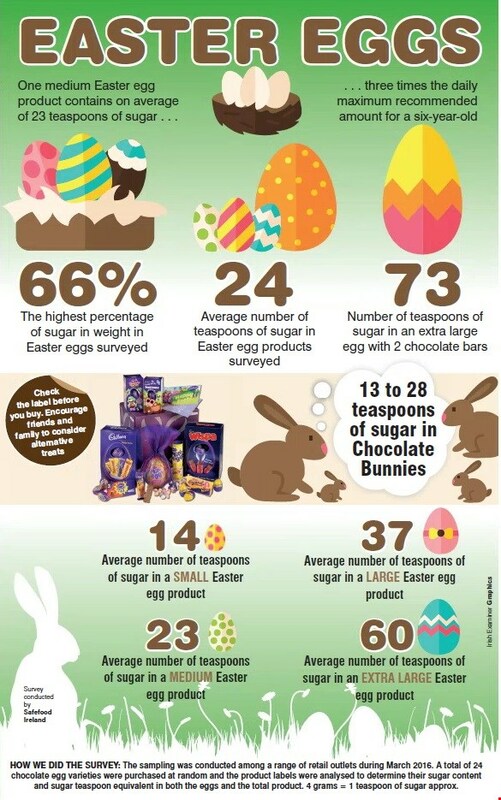 For instance, an extra-large Nestle Yorkie chocolate egg contains a staggering amount of 124 grams (31 teaspoons) of sugar: approximately 7 times the daily maximum recommended intake for a 6-year old kid. What’s more, this chocolate egg is sold together with a collection of 3 Yorkie chocolate bars (an extra 80 grams of sugar, approximately). Children often end up with a stash of several Easter eggs of various sizes: in the Republic of Ireland, 23% of children will get between 6 and 10 eggs, while 12% will take proud delivery of 10 to 15 eggs. Letting a child eat such a large amount of sugary products in one or few days is a threat to their physical and psychological well-being. We are not here to take all the fun out of Easter: one sugar bomb every so often isn’t going to make you fat or give you diabetes. Just remember to read the chocolate products’ labels, indulge in moderation and limit your kids’ chocolate intake on Easter Sunday. For the least added sugar, choose dark chocolate (70% cocoa), which has the added health bonus of antioxidants. Individually wrapped pieces of chocolate offer built-in portion control. Try mixing up the celebration with non-sugary gifts, such as coloured hard-boiled eggs or chocolate-covered fruit! Decide how much you and your kids are going to eat and put the rest of the chocolate away, out of reach. The Easter bunny loves carrots: use them for preparing some delicious (and healthy) home-made treats! Tagged easter eggs, food, Health, sugar, wellness. « Can Back Pain be Inherited?